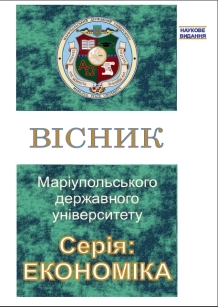 Journal of Mariupol State University was established in 2011. Mariupol State University - IV level of accreditation, certificate №057240 dated 11.03.2010. Rector of MSU, Doctor of political sciences, Professor, the Corresponding member of the National Academy of Pedagogical Sciences of Ukraine, Honorary Consul General of the Republic of Cyprus in Mariupol Kostyantyn Balabanov. The Collection of Scientific Papers “Journal of Mariupol State University”, series “Economics” is dedicated to the aspects of economic theory; globalization and regionalization of modern national economies; world economy and foreign countries’ economy development; cross-border cooperation; international transport borders expansion; free trade areas functioning; key priority territories; transnational corporations; development of tertiary industry, tourism, environmental sector, and recreational resources; international projects; topical issues of management and marketing. According to the decree of the Attestation Board of the Ministry of Education and Science of Ukraine, the Journal is included in the List of Scientific Professional Publications of Ukraine in the field of Economics (Decree of the Ministry of Education and Science of Ukraine № 642 dated 26.05.2014). The Journal is included in international scientometrical databases. The Collection of Scientific Papers is issued either in Ukrainian, Russian, English, Modern Greek, and Italian language or can combine two or more languages. All the series of the “Journal of Mariupol State University” are issued twice a year (in July and November). The articles shall be provided until May 10th in order to be published in July issue. The articles shall be provided until October 20th in order to be published in November issue. Papers sent after the deadlines shall be taken into consideration for the publishing in the next issue in case if the author does not object the consideration of the article.